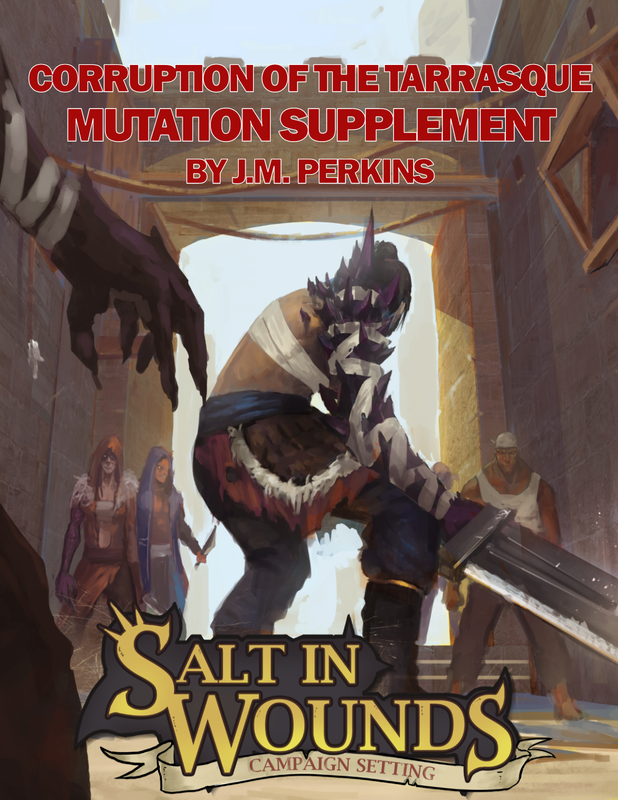 Even amidst the city as bustling as Salt in Wounds, the God-Butchers are hard to miss. Hugely muscled men and women, grown strong from a working life of toil and a diet of some of the freshest, most choice cuts from the ever-providing body of the Tarrasque. They carry their stylized greatswords nearly everywhere. Contrary to popular opinion, these weapons turned tools are not exclusively adamantine; many nowadays are forged of the Tarrasque’s bones or horns, material that cuts through its armored carapace well. Still, those who dismiss the butchers as dumb brutes wholly underestimate the order; these are hard eyed men and women who must be intelligent enough to understand the beast’s intricate and shifting anatomy, who must deal regularly with crafty merchants, domineering aristocrats, and suspicious laborers all to perform their duties. 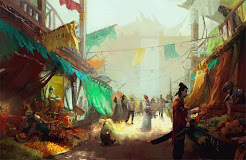 While greatly connected to the economic flows of the city, and perhaps not wholly immune to the influence of the coin, the God-Butchers nonetheless take their sacred charge of keeping the beast bound seriously. And while the recent tragedy of the 12th Meridian Crisis over a decade ago has marred their reputation and the Marrow Miners (with their greatly eased selection criteria) now enjoy a surge in popular support nearly everyone agrees that the God-Butchers have done a remarkable job keeping the Tarrasque bound for the last two hundred and fifty years with only minimum of loss of life. The chief complaint levied against the order is not that they’ve been corrupted (although, if you know the right God-Butcher any reagent or substance from the beast can be made available tax-free and irrespective of its legal status) but rather that they are too hide-bound to tradition, over reliant on the tactics of the past and notions of the ‘Sacred 13 Meridians’ which are increasingly useless as the Tarrasque's regenerating body adapts and (unbeknownst to most) the creature grows in strength. 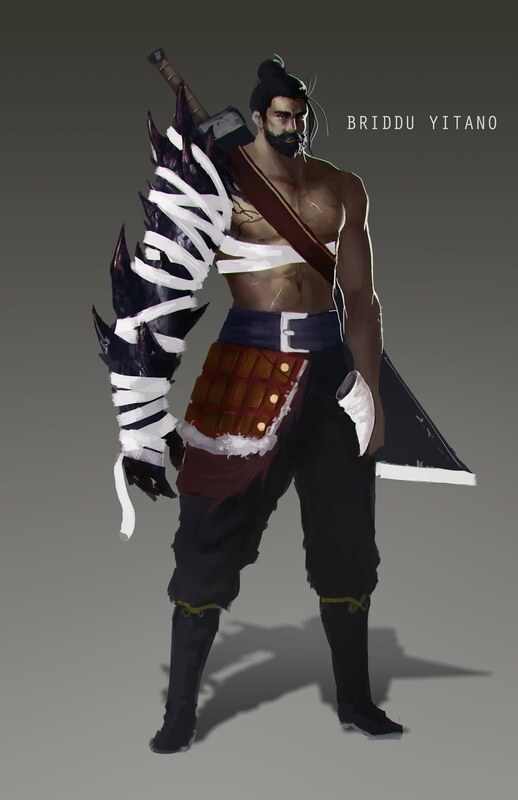 The God-Butchers recruit heavily (irrespective of class and station, ensuring that they are generally well-liked by the public and quietly mocked by the aristocracy) although most recruits are drummed out within several months due to the intense rigors of the training regimen. They also promote based on a more or less functioning meritocracy, with only a minimum amount of nepotism. Most members of the God-Butcher Order are not fully fledged ‘Master’ God-Butchers, around 95% of the order’s roster only complete their basic requirements and reach ‘Apprentice’ or ‘Journeyman’ levels. These members, despite their lessened titles, are nonetheless highly esteemed by the community and well compensated. Moreover, for most city residents a God-Butcher is a God-Butcher and there is little distinction based on rank. First and foremost, when recruiting and promoting the order is looking for strength, as it takes incredible physical power to break the creature’s armor and cut through its flesh. And while much of the work now is done with cranes, titanic screws and other butchering equipment the size of siege engines; not a day goes by where a working God-Butcher isn’t called upon to draw his blade to sever a vital artery or slice a tendon to keep the creature from wreaking havoc. To this end, while a use can always be found the strong, advancement amongst the butchers beyond the ‘apprentice’ level requires the aspirant to be intelligent as well: able to memorize innumerable details of anatomy and theory, understand intimately the meridian diagrams showing how the bindings have been placed and how the beast is held fast. The other requirement to reach journeyman rank is that God-Butcher aspirants must also be able to lead and inspire men. Despite what those outside the city may think, not everyone who works on the Tarrasque’s body is in fact a God-Butcher; there are countless machine operators, laborers, porters and more work on or in close proximity to the beast (not to mention the entirely separate organization of the Marrow Miners). Every hour of every day requires an intricate bustle of working men cutting away into the Tarrasque’s body to keep it sedate and to acquire some cut of meat or reagent for the market. When catastrophe strikes (a collapsing fold of flesh, emergence of ramora flea or other monster, runaway regeneration, etc.) a God-Butcher must be able to quickly access the situation and lead those around him either to safety or into danger themselves to prevent a greater danger to Salt in Wounds. As an organization, the Order of God-Butchers is fairly egalitarian, although relative prestige can usually be determined by their Meridian assignment 1-13 (excepting 12, which is now on assignment to the Marrow Miners), with each Meridian corresponding to what general part of the beast the individual works upon. While legally the 13 Binder-Lords each have the duty of keeping their Meridian bind functioning and overseeing the section of the Tarrasque assigned to their house, this -as a practical matter- has been ceded to the God-Butchers and -recently- Marrow Miners as the Binder-Lords have turned their attentions to the economy of Salt in Wounds, games of political intrigue with respect to their rivals, and the pursuit of their own pleasures. If a God-Butcher has distinguished himself in strength, intellect, and leadership they are invited to take part in the most sacred rite of the order, that of Mutual-Recognition. The difficulty of doing so explains why the number of full fledged ‘Master’ God-Butchers has remained fairly low (and perhaps why the order has remained largely effective and honorable in a city not known for such qualities). An hour before the rite begins, all work on the beast stops. The Tarrasque is allowed to heal, to regain as much consciousness as the God-Butchers dare. Then the aspirant must approach the first Meridian, the creature’s head. As the workers, curious citizens, and their fellow God-Butchers watch, the aspirant must stare into the eye of the Tarrasque for a full minute. In so doing, they are supposed to gain a fuller understanding of the beast they keep bound. Staring into the creature's eye as the beast roars and snaps causes some aspirants to flee; perhaps leaving the order or even the city forever. The mindless destruction and hate they see within the beast’s eye can unman even those who have lived in Salt in Wounds their entire life. Those who manage to continue to gaze into the creature’s eye will note a change in the beast’s behavior. Gradually, its endless screaming and thrashing slow. Its vision changes, focuses. And, for a moment, it see them; sees this man or woman who would keep it bound, who would cut it and serve up its strength to a hungry city. Then the Tarrasque will cease to roar and take a single moment to inhale through its nostrils, wind whipping past the aspirant towards the Tarrasque’s maw as it truly marks the God-Butcher’s scent. The accepted wisdom is that the Tarrasque to committing this individual to memory, will recall this smell of the individual. Should the Tarrasque ever gain freedom- the God-Butchers expect that it will hunt all such aspirants and their families (those who resemble the aspirant's smell) even unto the seventh generation. In turn, the God-Butcher takes in a long breath through his nose to mark the smell of the beast. As the roars, the endless thrashing against its bonds resumes, to achieve master rank the God-Butcher then ventures between its snapping jaws, timing a single strike to sever its tongue and heave the mass of flesh clear. The order will then have a huge feast that evening from the tongue, welcoming another full fledged Master God-Butcher into the fold.